DNA and RNA are the chemical carriers of genetic information in all known organisms. In most organisms, DNA (Deoxyribonucleic Acid) stores the genetic information and transmits to the progeny. RNA (Ribonucleic Acid) is mainly involved in transferring the genetic code for protein synthesis. Some viruses also utilize RNA as their genetic material. DNA is mostly found in nucleus whereas RNA is found in the cytoplasm of the cell. The key difference between DNA and RNA is that DNA consists of deoxyribose in its pentose ring and RNA consists of ribose in its pentose ring. Deoxyribonucleic acid or DNA is the hereditary material of most of the organisms. A majority of DNA is located in either the nucleus or nucleoid. Some may remain inside mitochondria and chloroplast as well. DNA carries the genetic instructions for the development, function, and reproduction of organisms. Sugar-phosphate backbone in DNA is formed by nitrogenous bases and phosphate groups attached to the sugar deoxyribose. C-H bonds in deoxyribose sugar are less reactive. Therefore, DNA is considerably stable in alkaline conditions. Four different nitrogenous bases can be identified in DNA: cytosine (C), guanine (G), adenine (A) and thymine (T). The two polynucleotide strands are held together by hydrogen bonds, forming between complement bases. Adenine (A) pairs with thymine (T) whereas cytosine (C) pairs with guanine (G). Thus, each strand is complementary. The two polynucleotide strands are further coiled to form a double-helix. Each strand in the double helix run in opposite directions, making the two strands antiparallel. The asymmetric ends of the strand are identified as 5′ and the 3′ ends. Major groove (22 Å wide) and minor groove (12 Å wide) can be found within the double-helix. B-form is the most common conformation of DNA within all organisms. The order which the four bases are arranged along the backbone encodes biological information within DNA stretches called genes. DNA synthesizes an identical copy of the original DNA, for reproduction. DNA can be easily damaged by ultraviolet light. Ribonucleic acid or RNA is mostly found in the cytoplasm. Some may be also found in the nucleus. Many viruses store their genetic information in RNA genomes. RNA has a vital role in the regulation and expression of genes. RNA is a polynucleotide composed of nucleotide monomers same as DNA. RNA has a much shorter strand compared to DNA. Ribose is the sugar which forms the sugar-phosphate backbone. Ribose is much reactive due to the hydroxyl group at 2′ position of the pentose ring. Therefore, RNA is not stable in alkaline conditions. Due to the presence of 2′ OH group, RNA exists in A-form. A-form geometry generates a deep, narrow major groove and a shallow, wide minor groove. The four nitrogenous bases found in RNA are cytosine (C), guanine (G), adenine (A) and uracil (U). Unlike DNA, RNA exists as a single-stranded molecule most of the times but it can form double-stranded secondary structures such as hairpin loops by complementary base pairing; Adenine (A) pairs with uracil (U) whereas cytosine (C) pairs with guanine (G). Most of the functional forms of RNA exhibit tertiary structure. The most biologically active RNA types are messenger RNA (mRNA), transfer RNA (tRNA), ribosomal RNA (rRNA), small nuclear RNA (snRNA) and other non-coding RNA (ncRNA). The mRNA, tRNA, and rRNA are related to protein synthesis. The ncRNA is involved in RNA processing and gene regulation. Some RNAs such as ribozymes are capable of catalyzing chemical reactions. Small interfering RNAs (siRNAs) play a vital role in gene regulation by RNA interference. Transcription is the process where the RNA synthesis is occurred using the DNA as the template. RNA polymerase is the enzyme which catalyzes the reaction. RNA is not damaged by ultraviolet light easily. 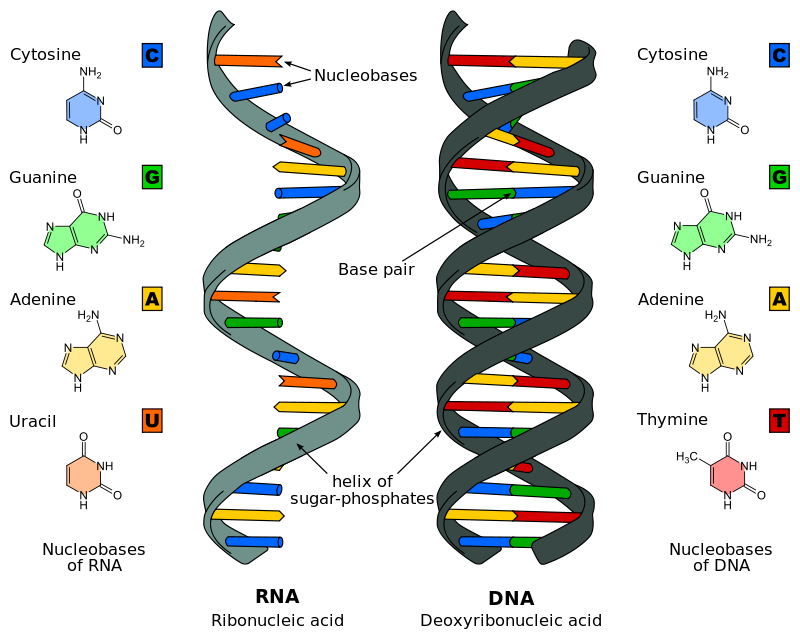 DNA: DNA stands for deoxyribonucleic acid. RNA: RNA stands for ribonucleic acid. DNA: DNA is mostly found in nucleus and nucleoid. RNA: RNA is mostly found in the cytoplasm. DNA: Deoxyribose is the sugar where the bases are A, T, C and G.
RNA: Ribose is the sugar where the bases are A, U, C and G.
DNA: DNA is a long polymer. RNA: RNA is shorter than DNA. DNA: A pairs with T and C pairs with G.
RNA: A pairs with U and C pairs with G.
DNA: DNA is double-stranded and it exhibits a double-helix structure. RNA: RNA is usually single-strand, sometimes it forms secondary and tertiary structures. DNA: DNA carries the genetic information necessary for the development, functioning, and reproduction. RNA: RNA is mainly involved in protein synthesis, sometimes it regulates the gene expression. DNA: DNA is stable in alkaline conditions. The small size of the grooves reduces the action of DNase enzymes. RNA: RNA is not stable in alkaline conditions compared to DNA. RNA exhibits much larger grooves compared to DNA and it is more prone to degrade with RNases. DNA: DNA is more prone to damage by UV. RNA: RNA is less prone to damage by UV. RNA contains a 2′ OH group in its pentose sugar which makes the RNA more reactive than DNA. Thus, DNA is comparatively stable than RNA due to the stability of the pentose group. RNA also exists as a single-stranded molecule because of the 2′ OH group. Thus, RNA prefers A-form of geometry. DNA, on the contrary, lacks 2′ OH group in its pentose ring. Therefore, DNA usually exists as a double-stranded molecule which prefers the B-form of geometry. Here, A-form generates wider grooves whereas B-form generates narrow grooves in the molecule. Stability against the degradative enzymes depends on the size of the groove. Thus, DNA is more stable than RNA against enzyme degradation. Therefore, the main difference between DNA and RNA is in their composition of pentose rings.